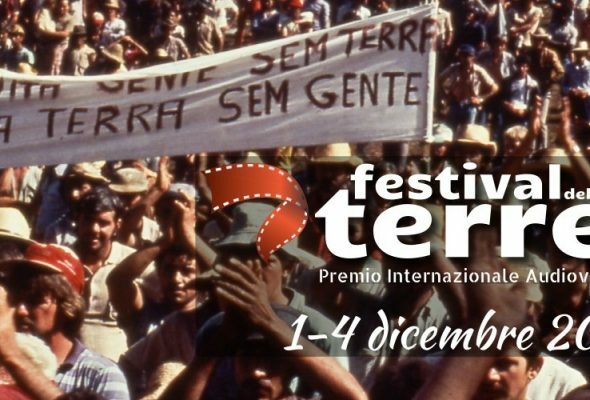 Hands on the Land partner Centro Internazionale Crocevia is pleased to announce that the 13th edition of Festival delle Terre will take place in the wonderful locations of Cinema Trevi of Rome and Teatro Quirinetta from 1 to 4 December 2016. Each year, the Festival delle Terre showcases a wide selection of documentaries, animation and investigative movies. The purpose of the event is to give a voice to farmers, local communities, indigenous people and people who fight for land’s rights all around the world. By screening documentaries, the festival promotes a better understanding of the issues of biodiversity, indigenous people, land’s rights, contemporary migrations and food sovereignty. This section will host documentaries about the following topics: safeguarding of soils, respect for the Earth and all small food producers, preserving ecosystems, rural resistance, food sovereignty as an alternative to the global speculation process of planet’s resources. ‘Indigenous people. Tales of dignity’. We welcome works that expose the problem of small communities that have to fight against industrialisation and global economic interests in order to save themselves and their living in harmony with nature. ‘Preserving the planet. Alternatives to feed the world’. This section will be dedicated to works focused on environment and documentaries about the sustainable management of the resources of the planet, biodiversity and food safety. The festival will also have a special focus on the theme of ‘bracciantato’ (farm workers) in agriculture. For this section we welcome works about rural resistance. The ongoing collaboration with Centro Sperimentale di Cinematografia will allow deepening the debate over this topic through the vision of films and documentaries of the National Film Library archive. Along with the screenings, this year’s program includes several parallel initiatives: photographic and comics exhibitions, meetings with the authors, debates and morning screenings for an audience of young people. The last day of the festival will take place at the ‘Quirinetta Theater’, where the most representative documentaries will be screened, along with the award ceremony and the evening show. Festival delle Terre will nominate a Jury to award the ‘Premio Crocevia’ (€ 500) and the ‘Premio Berta Film’ (a film distribution agreement sponsored by Berta Film, an Italian film distribution company active worldwide with a strong focus on documentary). The festival will be held in partnership with ‘Immagini dal Sud del mondo’, a yearly film festival that screens a selection of independent movies of African, Asian, South-American and European filmmakers. The competition is open to documentaries, docufiction and animation movies from all over the world with a maximum duration of 90 minutes. Registration is free of charge; the closing date to submit your work is October 31st 2016. Copyright holders of the films who intend to participate in the festival may include in the registration form a link for streaming or downloading, or send a DVD or USB pendrive, along with the plot of the film and the filmmaker’s bio-filmography. In case of selection no screening fee will be recognised for the authors neither for the film distribution company.